'Tis the season. Almost anyway. Warm breezes signal that summer produce is on the way! As for our family, we're planting the first of our garden (snap peas, lettuce, strawberries, rhubarb). So far nothing has died so I feel like an incredible farmer. (It doesn't take much, really, it doesn't take much.) Even roots I thought were dead and tossed to the side grew things. I seriously don't know how one can be more successful at gardening than that! To say nothing of my compost pile from last year. I have no idea what's growing there but we shall soon see. Part II of this book is all about the recipes which include ideas for everything from apples to tomatoes. Some things I want to try throughout the canning season include: Lemon, Red Onion, and Oregano Jam (hello! ), Peach Melba Compote, Pears Poached in Wine, Five-Spice Plum Sauce, Roasted Rhubarb, Smoky Tomato Salsa, Dried Apricots, and Blueberry Syrup. The difference between this book and the Ball recipe book is that the Ball book is chalk full of recipes, strictly, with a few pictures scattered about. (I love looking through the Ball canning book. I dream big whenever I do.) I like Put 'em Up! Fruit not so much for the recipes (although the ones contained in this book do look and sound delicious!) but for the suggested uses. Once you go about canning tons of fresh produce it can be a challenge to learn how to use what you've made in different and various ways so as to keep it appealing to the family you are trying to feed. I really like the way that Put 'em Up! Fruit: A Preserving Guide & Cookbook gives you some basic (but fun!) recipes for fruit canning but then also offers other recipes to pair with your creations. These recipes include: Blue Cheese Biscuits with Savory Cranberry Relish (using the cranberry relish recipe, of course! ), Butter-Basted Steak with Grape Reduction, Spring Rolls with Asian Dipping Sauce (using Apricot jam), and Sauteed Greens with Grapefruit Dressing among others. This is a handy, colorful and very fun book. I'm glad to have it sitting next to my Ball Canning Book as both should make our summer (and next winter) more exciting in the food department. Many thanks to Storey Publishing for sending a copy of this book my direction in exchange for my honest thoughts! Ooo-this sounds like something right up my alley! 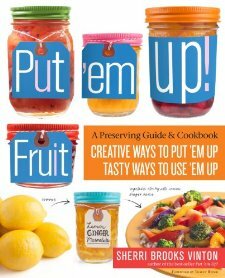 I've checked my new local library, and, while they don't have the specifically "fruit" version of the book, they do have Put 'Em Up: A comprehensive home preserving guide for the creative cook. One more title for my TBR list--and more dreaming of the day when I've got my garden established. Hmm, this sounds good, but the question is, would I really ACTUALLY can stuff or would I just think it sounds like an excellent idea.